Farming profits may be under pressure, but it is cash flow that typically presents the greatest challenge, according to accountant and financial planner Old Mill. Farmers should therefore take great care to plan ahead to avoid potential pinch points during the current downturn. 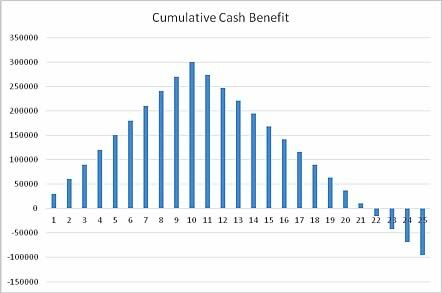 The graph below shows the cumulative cash benefit of extending the loan to 25 years. Of course, there is a link between profitability and cash flow, but producing a profit is no guarantee that there will be sufficient cash. “For example, a reasonably profitable farming business that buys an unusually large amount of stock will hold its value in assets rather than cash,” says Mr Butler. One area where a lot of businesses are exposing themselves to unnecessary cash pressure is where previous lending arrangements have been structured in such a way that the debt is being repaid too quickly. A typical example is a business that borrowed £500,000 to buy some land a few years ago, at a time of reasonably strong profits. For that reason the farmer decided that they could repay the debt over a period of 10 years, rather than the more usual 25 years. Rather than worry about where to find the cash now to pay essential bills, farmers should instead restructure such loans to spread the payments over a longer period, he adds. 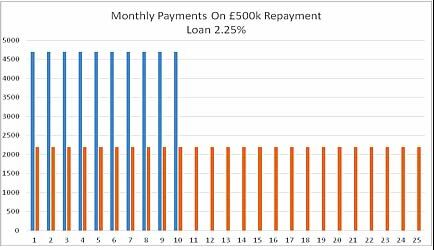 Based on an interest rate 1.75% over the Bank of England base rate (currently 0.5%), moving from a 10-year loan to 25 years would slash monthly repayments from £4,700 to £2,197.